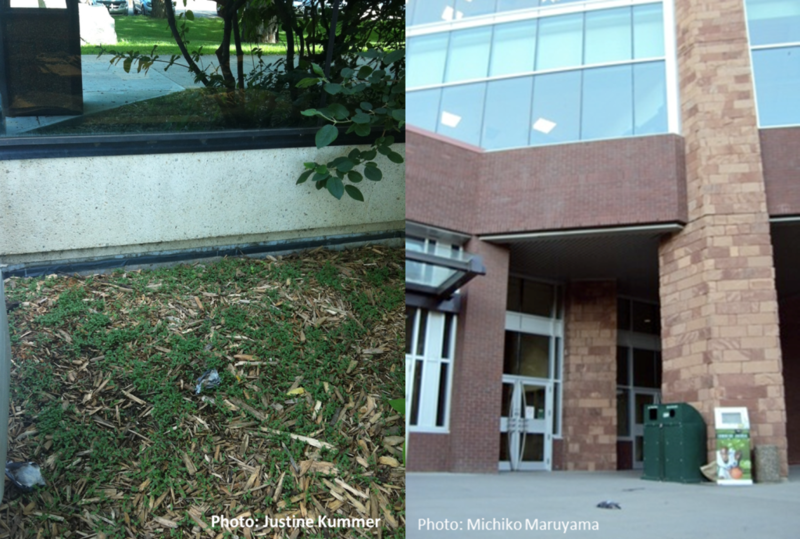 Bird mortality from window collisions is predicted and expected to occur wherever birds and windows coexist (Klem et al. 2009). Window glass is an invisible barrier to birds, and collisions occur as birds attempt to fly through what appear to be reflections of open space and vegetation (Klem 2009). Generally, this occurs as a result of panic flights where birds panic due to pursuit by raptors, the presence of cats or larger birds arriving at feeders, loud noises, and being chased by other birds (Dunn 1993). Unlike previously thought, bird window collisions are NOT random. Early studies suggested all bird species of varying size, health and conservation status were at risk and there was no time, season or weather condition during which birds are immune to glass (Klem 2009). Additionally, it has been believed that the best predictor of collision rate at any one site is the density of birds (Dunn 1993). Recent studies have shown this is not true. In a study by Hager et al (2013) the carcasses collected at 20 buildings tended to be low to moderately abundant species or species never detected during point counts. Many abundant bird species did not collide with windows. Environment factors, such as nearby trees and shrubs, and the presence of bird attractants, such as bird feeders, bird houses and bird baths, have been shown to increase the abundance of bird window collisions. In a study on residential houses, Bayne et al (2012) found rural residences had 2-3 more collisions than urban residences and urban residences with bird feeders had 1.5-3 times higher collision rates than those without bird feeders. Previous studies have been quite contradictory when identifying the season with the most collisions. Bayne et al (2012) identified summer as the most frequent season for collisions. However, Dunn (1993) reported winter and Longcore and Rich (2004) stated migration periods as being more prone to collisions. To date no study has used year round sampling to help understand the seasonal variation of window collisions. Why Are Bird Window Collisions A Problem? It is estimated up to 1 billion birds are killed in North America each year from bird window collisions. In Canada 25 million birds are estimated to be killed each year, with up to 90% from collisions with residential windows. However, these previous estimates focus on collision hot spots and do not accurately represent the area they are attempting to cover. A more accurate estimate is needed to help determine if the number of birds killed from window collisions is linked to regional and national population declines. It currently remains unknown whether mortality from birds colliding with windows is ecologically significant (Machtans et al. 2013). Even if analysis can show there is no relationship between population trends and collision mortality across all species, this would not necessarily mean that no single species or population of one or some species is affected (Klem et al. 2012; Schaub et al. 2011). Some relationships may not be significant in isolation but they will be a beneficial contribution to understanding the impacts of both window collisions and overall anthropogenic mortality on bird populations (Machtans et al. 2013). Previous studies have identified Passeriformes, perching and song birds, as the most prominent birds killed by windows but little work has been done within this group to compare vulnerabilities (Bayne et al. 2012). Bayne EM, Scobie CA, Rawson-Clark M. 2012. Factors influencing the annual risk of bird-window collisions at residential structures in Alberta, Canada. Wildlife Research 39(7):583-592. Dunn EH. 1993. Bird mortality from striking residential windows in winter. Journal of Field Ornithology (3):302. Hager SB, Trudell H, McKay KJ, Crandall SM, Mayer L. 2008. Bird density and mortality at windows. The Wilson Journal of Ornithology (3):550. Klem D. 2009. Preventing bird-window collisions. Wilson Journal of Ornithology 121(2):314-321. Machtans CS, Wedeles CHR, Bayne EM. 2012. A first estimate for Canada of the number of birds killed by colliding with buildings. Manuscript submitted for publication. Schaub M, Kery M, Korner P, Korner-Nievergelt F. 2011. A critique of ‘Collision mortality has no discernible effect on population trends of North American birds’. Plos One 6:e24708, Comments.